LADOT – Bikeways is proud and excited to finally embark on a pilot project for the placement of Sharrows throughout Los Angeles. May and June mark the opening phase of our Shared Lane Marking Study, where we measure the conditions for bicyclists on six different streets throughout the City. After the initial study (May-June), Sharrows will be installed as a pilot project (June-July), and another study late in the summer (July-August) will measure any changes in motorist behavior on these streets. With those results in hand, LADOT -Bikeways hopes to justify implementation of a boatload of Sharrows throughout Los Angeles. But maybe we should clear things up a bit. First of all: what the heck are “Sharrows”? For a good long while, the word “Sharrows” has been buzzing around the LA bike advocacy blogosphere. But drop the term “Sharrow” into casual conversation with the average Angelino and 9 times out of 10 you’ll elicit a blank stare. LADOT Bike Blog is about both outreach to bike advocates and about education for all Angelinos interested in bicycles, so let’s put everyone on the same page. Sharrows are shorthand for “Shared Lane Markings“, which are meant to identify streets designated as shared roadways for cars and bicycles. The physical representation of a Sharrow usually comes in two forms: the “bike in house” design (which was the first iteration) and the “chevron” design – sometimes called “Sergeant Bike”. 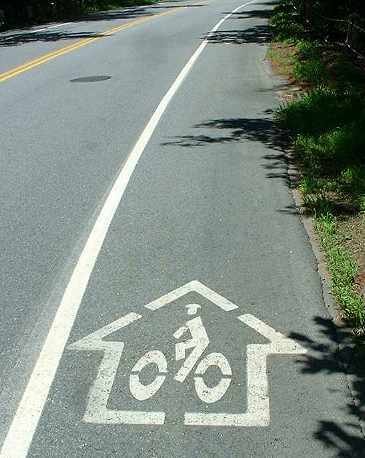 The chevron design is currently the only Sharrow design approved for use in California. You can check out the Caltrans design manual pdf right here. When Sharrows are added to the roadway, they must be placed at least 11 feet from the curb. What makes this position for a Sharrow so important? Getting out of the door-zone. Originally, when considering where to place a Sharrow, the first criteria was car parking. According to the 2010 California Manual on Uniform Traffic Control Devices (CAMUTCD), Shared Lane Markings are only allowed on a roadway which has on-street parallel parking. Today, the requirement is an 11 foot minimum for streets with on-street parallel parking to help keep bicyclists from getting “doored” by a parked car. For streets with no on-street parking and an outside travel lane of less than 14 feet wide, the requirement is for the center of a Sharrow to be at least 4 feet from the face of the curb. A bicyclist riding close to a lane of parked cars is in what is called the “door zone“, the space that a car door occupies when a driver opens it. While traveling in the “door zone”, a bicyclist could be hit by an opening car door, run into a car door that opens up in front of them, or get hit by a moving car after swerving into traffic to avoid a car door. One of the common critiques of bike lanes is that their 5 foot minimum often places bikes within this “door zone” when riders choose the right side of the lane instead of the left. In addition to keeping bicyclists out of the “door zone”, Sharrows help alert drivers to the presence of bicyclists. Too many times, a car traveling in the right lane will try to “squeeze through” the lane when a bicyclist is riding in the door zone. This “squeeze through” can be very dangerous, as cars will often come within inches of a bicyclist. Even if a driver doesn’t hit a bicyclist while squeezing through, it can cause the rider to loose control or get crowded further into the door zone than they would prefer. A close call can also be extremely intimidating and discouraging to a beginning bicyclist. Sharrows have the added benefit of encouraging bicyclists to ride further out in the road where drivers can see them in much the same way they see other cars. A bicycle traveling at 12 feet from the curb is likely to make a car move over to the left lane when they want to pass. When a lane is too narrow for a bicycle and car to share the space, a Sharrow puts a bicyclist in the safest position. In the spirit of Hans Monderman, forcing these types of interactions between cars and bicyclists can seem more dangerous while actually making the street a safer place for both. When drivers think their interaction with a bicyclist is dangerous, they will take more care in their actions. It is when a driver thinks their interaction with a bicyclist is safe, or when a driver fails to even consider a bicyclist, that a driver and a bicyclist are at the greatest risk of getting into an accident. Okay, great – So where can Sharrows go in L.A.? According to the CAMUTCD, “the shared roadway bicycle marking should not be placed on roadways that have a speed limit above 35 mph.” (Unless there is bicycle travel and there is no marked bicycle lane or shared-use path and the right-hand traffic lane is too narrow to allow automobiles to safely pass bicyclists). Class III Bike Routes and designated “Shared Roadways” are eligible for Sharrows. The Sharrows study and the forthcoming Bicycle Plan will determine which streets get the first Sharrows. Well, LADOT – Bikeways just completed gathering the data for a pre-Sharrows study on the 6 different roads that will host the City’s pilot project. Of the 6 streets, some were selected because of their status as Class III Bike Routes, some for their current usage by bicyclists, some for their ability to close gaps between existing bicycle infrastructure, and others for their uniqueness (each street represents a different type of road typology – different numbers of lanes, traffic volumes, curb lane widths, parking specifications, and speed limits). 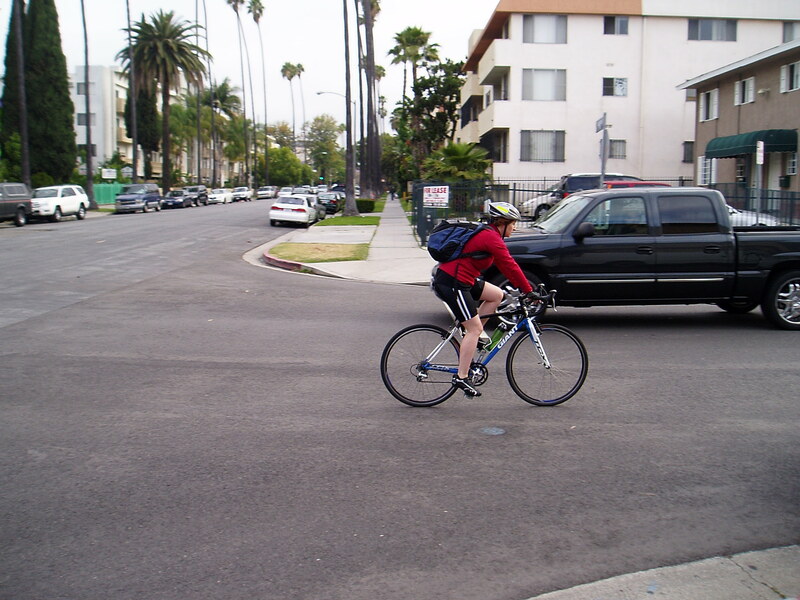 Over the summer, LADOT Bike Blog will cover the studies for pre-existing roadway conditions, the implementation of Sharrows, the studies post-implementation, and what it all will mean for the future of Sharrows in Los Angeles. Plus, pretty pictures! And remember: Bike safe out there.